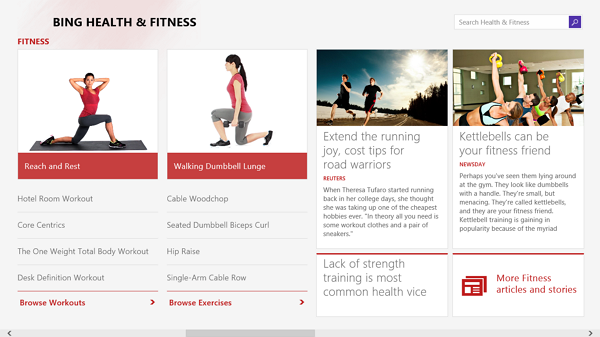 Microsoft introduced two new Bing app for Windows 8.1 preview, the apps are Bing Food & Drink and Bing Health & Fitness. Both the apps are included in the Windows 8.1 preview version. Previously Bing launched six apps for Windows 8 such as News, Finance, Weather, Sports, Maps and Travel. Bing Food & Drink app helps users to know thousands of recipies cooking techniques, shopping guides and culinary news all about kitchen. The app includes how-to guides, tips and tricks to help you master culinary techniques. 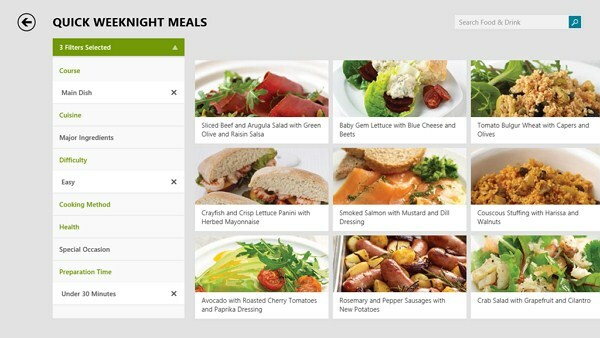 Bing appointed some world class chefs to provide insights, recipes and culinary tips for users. And also you can add your own recipes using Add recipe tool. The app includes various useful features including Instant shopping, Meal planner and more. The app helps users to know nutrition, fitness and medical information. You can track your diet, exercise and health history in the app, and sync it with Microsoft’s HealthVault to pull in your medical records and information from devices such as blood glucose monitors, electronic scales and FitBit. To try these apps you have to download and install Windows 8.1 preview.